The Mt. San Antonio College Pride Center opened in 2016. Every October 19, we celebrate LGBT Center Awareness Day, and in 2017 Sierra College (Rocklin, CA) and Mt. 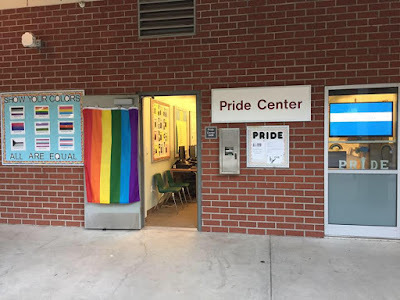 San Antonio College (Walnut, CA) also celebrate supporting LGBTQ community college students with professionally-staffed Pride Centers on their campuses. When the Pride Centers opened in 2016, they effectively doubled the number of campus LGBTQ centers serving 2-year institutions in the U.S. Visit the Directory to learn more. The campuses developed different models of support. Sierra College hired a full-time Student Engagement Specialist, Mo Merritt, to supervise student scholars staff in three engagement centers, including a Pride Center, Cross-Cultural Center, and Women & Gender Resource Center. Peer leaders rotate through the centers, creating intersectional equity-driven programming. For example, in their first year, students organized events such as “That’s the way the gender crumbles” – a conversation on gender identity and expression with ginger bread people. Peer leaders also staff the center’s front desk during open hours, with pro staff stationed within the space. Mt. SAC’s model was to give 40% release time to their founding Faculty Coordinator in 2016, History Professor Kim Earhart. Kim coordinated special events with students, such as Harvey Milk Day and a Lavender Graduation. The Pride Center provides a space for students to find community and resources. In addition to the Coordinator’s hours in the Pride Center, other faculty volunteer their time to keep the center open more often. Mt. SAC’s new coordinator for 2017-18 is Professor Melinda Bowen. The two campuses also took different paths to opening their Pride Centers. At Sierra College, faculty drove the formation of an Equity Plan and Equity Center, to improve the success of impacted student populations. The Pride Center already existed as a volunteer-run space, and the campus added the Cross-Cultural Center and Women & Gender Resource Center to create the three new engagement centers overseen by the Student Engagement Specialist. What are significant experiences or observations you can offer to help us understand the LGBTQ climate on campus? What in your wildest dreams can be done to improve the LGBTQ climate on campus? What steps should be taken immediately to make some of these dreams come true? The World Café Dialogue on LGBTQ Climate Summary Report of responses led to the development of the Pride Center a year later. Read the full report by clicking here. Other California Community Colleges continue to address the needs of LGBTQ students through staffing and student spaces. MiraCosta College (Oceanside, CA) for example is hiring a new part-time LGBTQIA Equity Specialist. Los Angeles Valley College is developing a business plan for a staffed Pride Center. They recently launched a campus LGBTQ+ Resource Page. CCC faculty staff, administrators, and students will be attending the CCC + LGBTQ Summit on November 11, 2017 at UC Riverside, with the opportunity to share models, equity plans, and best practices for supporting LGBTQ people at community colleges. Online registration is free until October 27. Update: The LGBTQ+ @ California Community Colleges web site also recognizes 4 CCC campuses for offering LGBT centers that are volunteer-run: City College of SF, Los Medanos College, Palomar College, and San Joaquin Delta College.